Meet Valerie Anne Kelly (aka Valzart). This is where the rubber of digital art meets the road. The image you see here titled Russet Lane was created using Corel Painter 11 and Photoshop CS4. 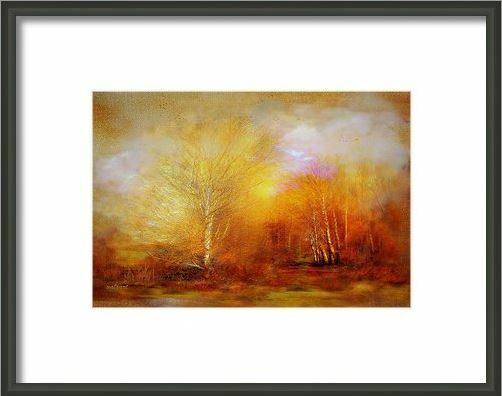 Valerie tells us this particular work was inspired by Keats’ poem “Ode to Autumn” seasons of mists and mellow fruitfulness. She calls her method “Tradigital”. I am so pleased to feature Valerie’s work this week. visit her profile at RedBubble. Knowing that she creates work like this digitally just astounds. “Valerie Anne’s dedication to her art and photography, developing and exploring her talent, designing varied art and artist networking sites and art selling sites is to be commended. I find Valerie Anne to be the caliber of artist that displays a wide and comprehensive knowledge of photography, digital editing software and computer science. It has been my pleasure to be associated with this amazing artist. Win Charles, artist @ RedBubble was with another company when working with valerie anne at valzart. I cannot recommend Val enough, a true artist through and through, and will always make time to help others. Her work, it speaks for itself. Fantastic images that reflect Valzart’s exceptional imagination and creatiity. She continues to cross boundaries and stretch herself to the limits to create her elegant art in many genres. I am delighted that she is a brilliant member of the group I host on redbubble.com/people/drjmarks, “the healing journey.” Julie Marks. Love all your work!…but I really love your image Friendship :)) It makes me think of a gigantic book shelf, and much like life, we all have our own individual storys, and experiences. When it is all said, and done, and just as the books are all knit toghether on the shelf. So one day all the many stories become “one” very beautiful image that manifests itself. I like the two trees, its like the garden of Eden, and the books are the story of all time 🙂 It inspires me! Thank you! Carolyn Wright. Valerie is a magnificent Artist.Her artwork is very expressive ant totally gorgeous! I am privileged to be able to say that Val has been my friend for several years. I have always known her to be filled with joy and enthusiasm and honor. In addition, her incredible artistic creativity has always set her above the crowd. Valerie’s art is incredible! She is a wonderful human being who’s inner beauty shines through in every one of her creations.